By now I’m guessing you’ve noticed my pillow obsession. But it’s a crazy easy way to quickly change the feel of a room. For this fall, I made (and still have a few in the works) new covers in jewel tones. This diagonal cover was as easy as cutting an eggplant 19 inch square. Then I used a yard stick to make a line across to cut along. And pinned a 3 inch strip of gray along. The corner is a darker gray piece. To finish it off, the back is an eggplant envelope back. Another pillow started with the same light gray cotton and I marked a grid on the back with a yard stick. Using embroidery floss, I made small plus signs along the grid. By keeping a 1 to 2 inch tail, then stitching the plus, I could easily tie the loose ends together. It made a cute, simple design. For a reversible cover, I used scraps of light gray, eggplant, and dark gray to make a striped envelope closure. Oh, and the mirror pillow from Sears is awesome. Thin gold threads hold the mirrors in place, making a great texture and shimmer. 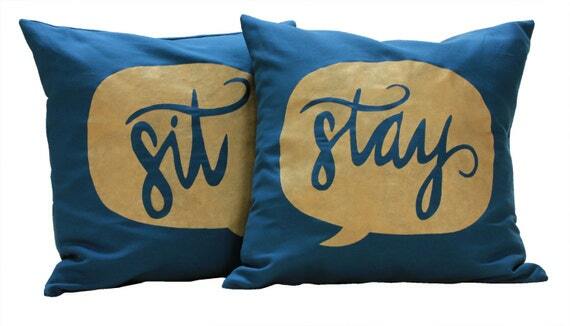 Also, I’ve added custom Sit and Stay pillow covers to the shop. Now I’m going to finish my living room pillow covers. What pillows are you loving this fall? Target has a really, really fun selection that I’m trying my best to not take home with me. as always…adorable! You should put more pillow covers in your shop! I love the lumbar pillow with the plus signs. 🙂 I also love that you tell us how you made these cute, easy new items for your house. I think I might have to make some pillow covers now! I wish you’d show the back sides of the pillows too. Are they a button closure or do you stitch them shut? I did show the back of the plus sign pillow. I like envelope closure pillows. The back flaps overlap by 3-6 inches so they’re super easy and removable. Here’s a super easy way to make one: https://ourhumbleabodeblog.com/2010/08/24/sew-it-begins/ You can do the same with different fabrics for the front and back, too. Love the plus sign pillow, and it’s so simple, I think I might try it! All so fun but I have to say that I’m drooling over that stitch pillow! !